More often than not, women in these parts of the world have little assurance of set pay rates to compensate their efforts. 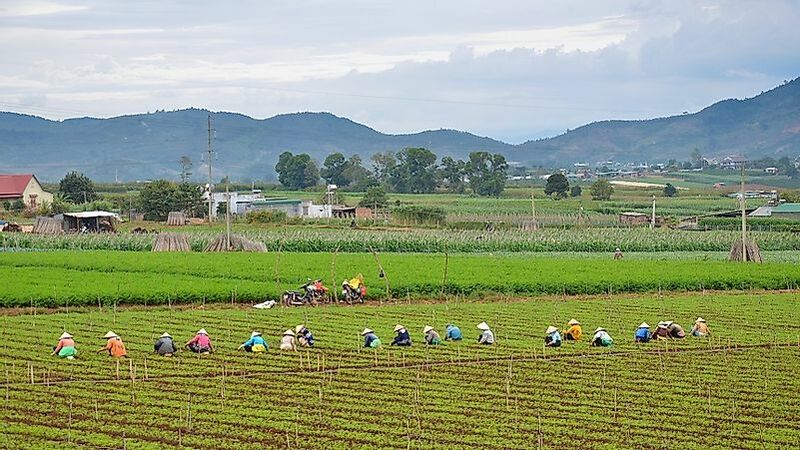 Female farm workers, such as these in Vietnam's Mekong River Valley, work long hours for volatile, often low, pay. The situation is the worst in Africa, in least developed countries. In Suriname, only 1% of women have jobs with a set salary, and the same metric is around 10% in several other countries, including Ethiopia (7.8%), Tanzania (10.7%), and Uganda (13.4%). Developing and some emerging countries from Asia and eastern Europe are also among the places with the least levels of income security for women, such as Azerbaijan (29.2%), Vietnam (29.4%), Indonesia (33%), Albania (36.9%), Georgia (38.4%), and Thailand (40.7%). Why do Women Receive Unstructured Pay in These Countries? In Suriname 60% of the workforce is organized and 50% have set wages, working in services (70% ), manufacturing (8.3% ), commerce (17%), agriculture (5.9%) and transport and communications (7.8%). However, women are expected to stay at home and fulfill traditional gender roles, which is usually unpaid work. They thus have limited options of participating in the organized work sector. In most of the ten countries,women have less access to education and training to develop their skills, which places them at a disadvantage when they compete with men for jobs, ending up in lower skilled employment. Furthermore women in these countries are likely to have have limited ownership of property. This decreases their limit to capital, hampering business prospects. Paid jobs can be in either the formal or informal sectors. Worldwide women are over-represented in the informal sector. Though both men and women receive less pay in the informal sector compared to formal sector, the gender gap in payment increases in the informal sector. Informal employment is the primary source of income for women in developing countries. In African countries women are found working in the informal sector, being self-employed as street vendors or working for the family, in which case there is no question of a set wage or salary. Home-based employment is the important source of income for 85% of women worldwide. These would home-based units could be at the end of the global chains, where work is contracted to local groups who sub-contract it smaller units and lastly to women working from home. There are 73% to 99% of people employed in street vending and it accounts for 50% to 90% of the gross domestic product (GDP) in developing countries. Women make up to 75% of street vendors. In addition due to competition from global players, the women are losing their niches or get paid less. So market liberalization and integration has driven wages down for women in these countries. Even when they work in the informal sector, women are do not receive set wages as they work on sub-contracts, or are involved in casual work unlike men. In Indonesia informal sector accounts for 99% of the employment, of which women make up 50%. The contribution women make to the informal sector is 20% to 60% of the GDP, which is higher than their share of the employment sector.Moreover men are involved in non-food and larger operations, while women are involved in small-scale and food industries. In addition, men fare much better as they face no discrimination or competition from women, since women are excluded from many organized sectors. Other than laws on paper, the governments in many of these countries, including those in Suriname and Tanzania, have taken no or little steps to improve working conditions for women. Tanzania has legislation that guarantees minimum wages, and protection against discrimination, however reality shows a different picture. Despite equal legal status, women face discrimination in hiring and wages or salaries they receive. The role of governments in regulating markets is also decreasing in the process of market-liberalization, with several public sectors getting privatized. Insecurity and lower incomes for women results in women having lower pensions later on in life, and this is evidenced by the fact that 22% of elder women are likely to retire in poverty, significantly more than 16% seen among men men.